We have been receiving incredible support from blogs, DJs and music lovers alike for Stresses and Definitions, but one of the biggest supporters is without a shadow of a doubt Trickta. The driving force behind Park Street PR, UK Runnings, Wolftown and the Beats & Bars events, Tricksta is one of the most humble and hard working guys in UK HIp Hop, so to be involved in not 1, BUT TWO UK Runnings Estate Life mixtapes is a true honour! AND if that wasn’t enough we are on the front cover! Please download the free mixtape, featuring the likes of Harry Shottam Serocee, Mic Righteous, Big Dutty Deeze and many more, and spread the word about this amazing mixtape series which has flewn out the gates for 2014! It’s been a busy few weeks for Delegates Of Rhyme. We are seriously excited to announce that UK RUnnings have dropped another BRAND NEW delegates of rhyme track, this time featuring Alex-is and Joe Bird on the cuts. The track is called “Road to Ambition” and you can grab it from the link below, as well as some amazing tracks from the likes of Big Cakes, Dubbledge, Yogi, Scrilla and loads more and it’s all FREE!!!! Stresses & Definitions – Released today at 7pm! 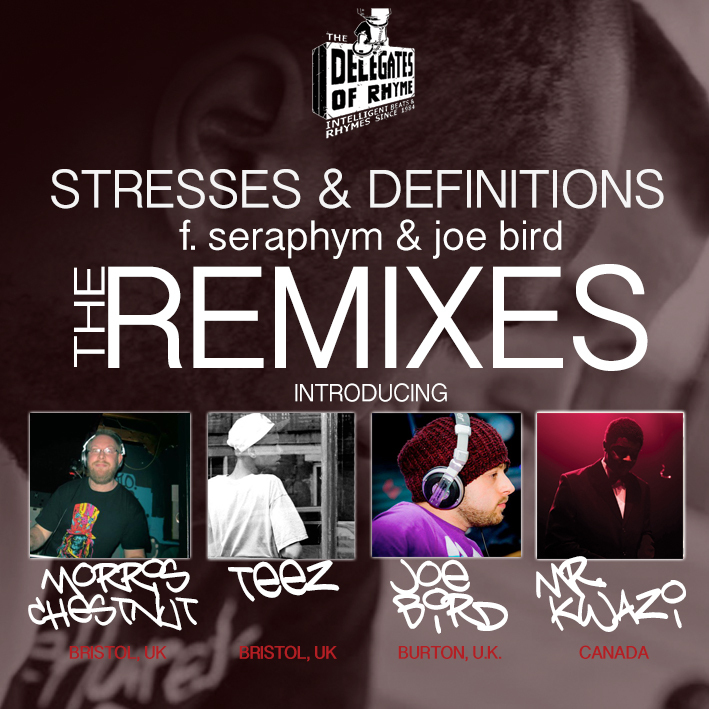 Today the remixes for The Delegates Of Rhyme – Stresses & Definitions (Released last Saturday) are dropped at 7pm GMT. Mr. Kwazi is a multi-instrumentalist, producer, and beatsmith hailing from Ontario, Canada. A relatively-fresh face in the electronic music and beat scene, he has already caught the ears of many as a finalist in the Stussy Make Beats and Olivia Broadfield ‘Say’ Remix contests – in addition to collaborations with artists in Canada, USA, and the UK. Inspired by a vast musical background and by artists of many genres, his multidimensional style melts moody vibes into fresh drums, fuses classical precision with off-beat rhythms, and breathes new life into any sample he touches. The recently-released Bachelor Pad EP displays his sampling skills, using one song to create all of the album’s eight tracks. Mr. Kwazi is a dynamic artist to be on the lookout for. Morris Chestnut is the funkier, soulier alter-ego of Joe Thompson, a musician and producer who’s been writing and releasing music of all shapes and sizes for as long as he can remember. From playing in bass and keyboards in blues and rock bands as a spotty youth to working as a producer for a number of mainstream dance DJs, it was only a matter of time before Joe returned to the purity of funk and soul as the basis of all grooves and the real roots of dance music as we know it. Taking a cue from visionaries such as George Clinton and Afrika Bambaataa and following in the footsteps of cut’n’paste heroes such as The Avalanches and DJ Shadow, Joe donned his “Morris hat” and went burrowing through mountains of classic soul, funk and disco cuts looking for magical snippets of forgotten tracks and hidden gems to weave together with more modern elements of hip-hop, breaks and the rapidly growing nu-funk and ghettofunk scenes. The first result of this audio-scavengery was the Better Living EP released on Pig Balls Recordings at the start of 2012. Featuring remixes from scene legends such as Funkanizer, Trotter, Rory Hoy and Pig Balls head honcho PulpFusion, this was a perfect platform to launch the Chestnut sound onto an unsuspecting world. Then in 2013, “…And Then This Happened!” was released; a 14 track album crossing the board musically from soulful hip-hop to nu-disco, via swingstep and funky breaks. With great reviews from leading funk-scene tastemakers Monkey Boxing and Flea Market Funk among others, “…And The This Happened!” hit the number 1 spot on Juno’s funk charts the same week it was released. With a slew of new singles, collaborations and a new album on the way in 2014, you can guarantee you’ll be dancing to Morris in some form or another soon!!! Joe Bird is an incredibly hard working beatmaker, producer and youth worker from Burton (UK). As the creator of Rap-Torial, alongside MC’s Jaws and Shell Skruface, a member of the MUD collective, and a talented DJ in his own right, Joe is a regular name on the local scene. With increasing involvement in The Delegates Of Rhyme, and his EDM crew Them Deviants, Joe is a strong force in the UK and a name to watch in 2013 and beyond. Teez is a talented young producer hailing from Bristol. Learning his art at an early age, Teez’s production has already garnered support from the likes of Dan Oddysee and Frankie Stew. As both a producer and MC, Teez is quickly establishing himself as a force to be reckoned with. WIth upcoming collaborations including Bristol heavyweight Relly, and remixes and full collaborating with The Delegates Of Rhyme and more, Teez is a name to be remembered. The Delegates of Rhyme return with their long awaited single “Stresses & Definitions”. Featuring Seraphym aka Dina Deez, an incredible lyricist from Birmingham, Stresses tells the story of different three characters from different perspectives. Offering an insight into modern day living and the perception of women within music, the vocals work alongside a soundscape from Vice, the production arm of The Delegates of Rhyme, offering a golden era-esque feel giving the track depth and character. To complete the vibe, Joe Bird of Rap-Torial creates an intricate tapestry of cuts to weave together the three verses, adding context to lyrics. Joe’s constant input in The Delegates Of Rhyme includes cuts, remixing and even recording certain elements of the forthcoming project. With The Delegates of Rhyme already receiving support from the like of BBC Introducing, Disorda, DJ Shorty, Carasel (Ambush The Airwaves), A Gee (Itch FM) and many more, the duo are rapidly garnering attention and support from the UK and beyond. “Stresses and Definitions” is the second full release from The Delegates Of Rhyme’s forthcoming debut album entitled “Assemblage” coming mid 2014. As with their music, the group take an alternative approach to visuals, and as opposed to going for a standard music video they have created a stripped down, sombre yet beautiful sunset visual, that allows for Donnie’s words to be really heard. Filmed and edited by Vice, and shot in Bristol during a two day recording session, the video offers a moment of contemplation. This is an exclusive radio interview with Donnie Numeric of the Delegates of Rhyme and The Popables, taken from the Kaleidoscope Show on Passion Radio Bristol on the 4th January 2014. In the interview talks about the next single release “Stresses & Definitions” which is to be released on 11/01/2014. For the Delegates Of Rhyme section of the interview skip to 6m 07secs! In addition to the Delegates Of Rhyme, Donnie also talks about the Popables recent LP release and his forthcoming project entitled “Yellow Haze”.